An ornamental fence is not just like any other fence, it is a fence that makes a statement when anyone encounters any side of your property. They are not just boundaries or objects to keep dogs and other animals away, they are a beautification element to the property. Ornamental fences have been in existence for a long term and the different types in the market range from the classic to the modern styles. If you are looking for the best Ornamental Fence Installation Minneapolis & St. Paul, MN has to offer, check us out. We use the latest equipment to install for you any kind of fence around your property. Iron fences are elegant fences that breadth air to the view of the garden and property. It’s a simple fence that has long horizontal rods crowned with arrowheads that are normally of different colors from the rails. There are various designs of the arrowheads available, which have decorative styles and artwork that bring about different styles of beauty to the garden. The classic picket fence is the most popular style. It entails spaced pickets arranged in a vertical style, different decorative styles are applied dependent on the taste of the homeowner. The pickets are normally of different heights. Lattice fences that have wooden lattice enhance the decorative panels of the fence. Another option is the shadowbox fence that uses offset picket rows to create privacy to the property. we can help you select the best wood fence for your yard. These types of fences try to duplicate the wooden fence styles. They are common with their square profile which is different from the picket fences that are flat in profile. Vinyl fences are very flexible since they imitate other fencing styles like the iron fence. The prefabrication property of this material makes it easier for people to install the fence hassle free. It is a good alternative as it is easy to maintain than iron or wooden fences. 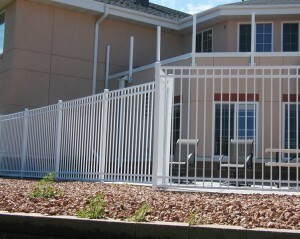 Aluminum fence style takes after the iron fence style, its differential factor comes with its finail capped pickets. It has diverse styles that also comprise of more modern styles that have horizontal and vertical lines that are simple and clean. The beauty about this type of fencing is its lightweight property which makes it easier to install and maintain compared to the iron fencing option.